Summary: "Earth Hour" is observed worldwide, including here in the 'Burgh. 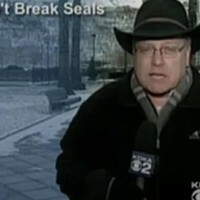 Reporter: David Highfield, KDKA. Airtime: 1 minute, 57 seconds on March 28 Visuals: * The UPMC logo atop the U.S. Steel Tower, unlit. * Shots from both CMU and Pitt's campuses, their lights turned off as a symbol of global solidarity. Highlights: * When Highfield announces, "From 8:30 to 9:30 tonight, some buildings and people's homes in Pittsburgh went dark. It's part of a global call to cut energy use and highlight the danger of climate change." * When Highfield narrates, "The Highmark sign and the lights atop Fifth Avenue Place went dark. So did the UPMC sign on the tallest building in Pittsburgh." * When City Councilor Bill Peduto explains, "The goal this year is not just to turn off the icons, but to get it so that people understand they can make a difference in changing this world." 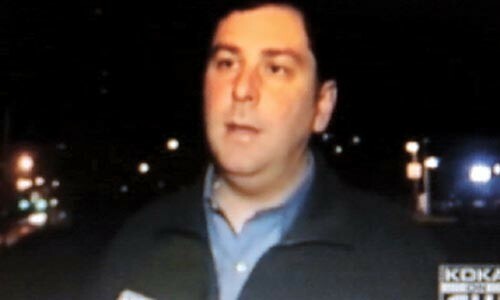 * Highfield: "[Peduto] says 16 institutions agreed to dim the lights. The Cathedral of Learning on Pitt's campus, buildings at CMU -- all dark. But he also encouraged people at home to take part." * When Peduto asserts, "We have the ability, by ourselves, as individuals, to make a difference." * Highfield: "And it wasn't just here in Pittsburgh. Landmarks like the Empire State Building in New York and the Las Vegas Strip were expected to go dark tonight. It was lights out at the famous Opera House in Sydney, Australia. And crowds celebrated as one by one, bridges, towers, even restaurants went dark." * When Highfield explains, "Earth Hour in fact, began three years ago in Sydney, organized by the World Wildlife Fund, and now it's spread." * When Highfield relays, "It's estimated 4,000 cities and towns in 88 countries are participating tonight." * When a representative of the WWF Philippines contends, "This is a statement against climate change. This is a statement that we are not gonna go down without a fight." What We Learned: Every little bit counts. If we could only stress that idea when it comes to tossing cigarette butts on the ground ... Unanswered Question: Only 16 institutions were on board? Why so few? News Value: 4. Obviously, shutting off the lights for an hour a year won't save the planet. But kudos to those who do their best every day trying. This was a pretty straightforward desk story, but some canned footage fleshed it out nicely, and the whole package was lit up by the dazzling Mr. Peduto.